Alba loves life just as it is – she has her drawing, her best friend Grady, a fun group of friends, and a wonderful home living behind her mother’s bakery/cafe in the small town of Eden Valley. Alba would be happy if nothing ever changed. As Alba and her friends finish school, she is continues to deliberately avoid thinking about the future, but sometimes life has a way of making you face the things you fear most. The boy Alba thought had gone from her life forever suddenly returns to town and Grady, her dependable, always-there-when-she-needs-him best friend is acting weird. Oh, and there’s also the small matter of a TV doomsdayer announcing that Alba’s home town will be the best place to view the the end of the world, which is scheduled for New Year’s Eve. If Original Ned’s prediction is right, it looks like Alba won’t have to worry about what the future holds after all. With more laughs that you would generally anticipate from an account of the end of the world, The Incredible Adventure of Cinnamon Girl is filled with quirky characters, humorous dialogue, and all the confusion and chaos you’d expect when a small country town is suddenly invaded by people desperate to be in the best position to view the end of the world as they know it. The Incredible Adventures of Cinnamon Girl is more light-hearted than author Melissa Keil’s debut novel Life in Outer Space (KBR review). There is no pressing sense of conflict as the story progresses. Readers are never really in any doubt about the predicted end of the world and even the romantic tension between Alba and Grady resolves in a reasonably predictable way, although my heart did ache for Grady a little as Alba steadfastly ignored any possible change to their friendship. What the story does offer, however, is a very warm and inclusive sense of friendship. The group of school friends have diverse personalities and are heading in different directions, but their dialogue features the kind of good-natured banter that comes from a shared history and genuine affection for each other. Alba’s interest in comics and drawing adds another interesting element to the story. There is also the very relatable sense of being on the edge of something new. One stage of Alba's life is ending and the next is about to begin. Her world is full of possibilities, but she needs to make some decisions if she wants to move forward. 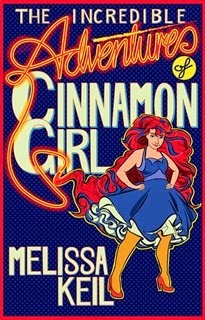 The Incredible Adventures of Cinnamon Girl is a sweet, light-hearted entertaining story that had me laughing out loud at times as well as remembering that stage between high school and adulthood when life seemed so full of possibilities. Alba, Grady and their friends are funny and endearing and the chaos in Eden Valley as the end of the world approaches (maybe) is a great backdrop to the friends' questions about what their future might hold.